Universal Transverse Mercator ­ UTM or the USGS Grid system). 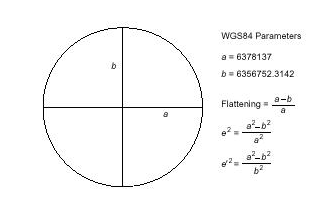 the formulation used, ellipsoid "flattening" may be required. degrees) and the XY plane make up the equatorial plane (latitude = 0 degrees). not to be confused with the mean sea level datum). LLA to ECEF (in meters) is shown below. between the two surfaces is illustrated in Figure 4.
regions where mass distribution can vary rapidly.